A GPS device is a must have if you want to enjoy golf but I hate the fact that you have to stop and look at the instrument to get distance information. 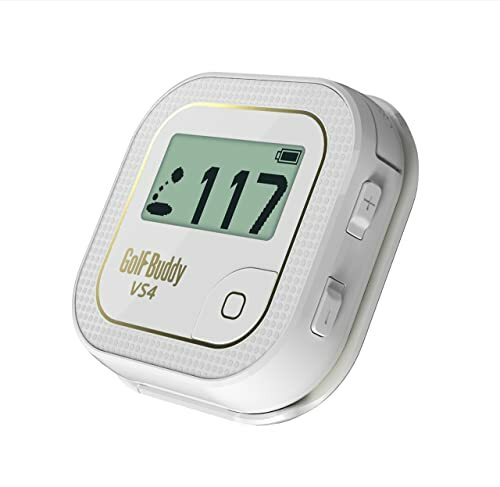 The GolfBuddy VS4 solves this problem with a voice that lets you know everything that you need even without looking at the device. VS4 will offer you a lot of conveniences and speed up play. A GPS device is a must have if you want to enjoy golf but I hate the fact that you have to stop and look at the instrument to get distance information. The GolfBuddy VS4 solves this problem with a voice that lets you know everything that you need even without looking at the device. VS4 will offer you a lot of conveniences and speed up play. Apart from this, it is also very easy to set up and has many other features that include shot measurement and auto course and hole recognition. Audio Distance Measurement: This device is one of the first talking GPS devices, and it is designed to give you the information in an audio form, and hence you never have to look at the screen. Preloaded Course: Can hold up to 40,000 courses and so you can use it in any part of the world no matter how remote it might be. There are also no download and annual fees, and so the buying price is all that you will pay to own the VS4. Distances Measured: GolfBuddy VS4 measures the distances to the front, back and center of the green and hence giving you all the distance information you could ever possibly need. Auto Course/Hole Recognition: You never have to worry about finding the course that you are playing in since the device will do it automatically. It will also identify and progress to the next hole. Multi-Lingual: It offers you the opportunity to choose a language that you are most comfortable with as it can operate in different languages. Shot Distance Measurement: With the GolfBuddy VS4 Golf GPS you will always know how far you hit the ball, and so you can use this information to determine which club to use for a shot. Operation: It operates using five small buttons, and it displays information on a Mono LCD. Battery: The rechargeable battery will be able to take you for 10 hours when fully charged. Nine hours are enough to enjoy a couple of rounds of this beautiful game. Convenience is one of the primary advantages of this GPS device and for many golfers, this is all they look for in a best golf GPS device. This unit is small, and you can even carry it in your left pocket when on the course. Distance measurement is also very convenient as you will not have to look at the screen to get information because it has an audio feature that will let you know what you want through voice. And the best thing is that it is multi-lingual meaning you can choose from a number of languages. Another benefit is its long battery life as you will never have to recharge it in between rounds. It has a very easy setup that you should be able to figure out even if you have never used a similar device in the past. Just like most GolfBuddy devices it has been designed to be a plug n play golf GPS. Auto hole and course recognition feature works very well, and this will make things easier for you, and you will enjoy playing the game. 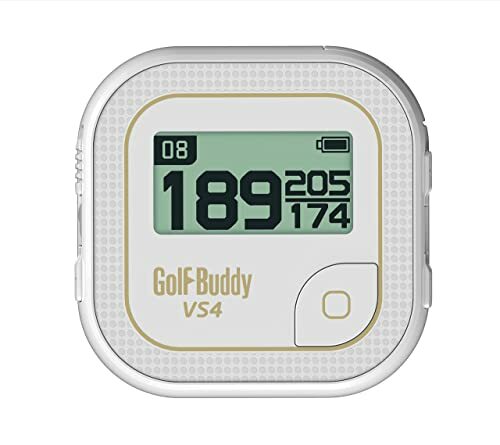 GolfBuddy VS4 will speed up play unlike other devices since you do not even have to stop to look at the screen since the voice will give you the information you need. Although it might not be the cheapest in the market it is still very affordable especially due to its many features and the value, it adds to your game. Although it is also possible to wear it on the wrist, the design will not work as well on your hand as a GPS watch, and so it is better to have it on the belt or clip it on a bag. The GolfBuddy VS4 may be a small device, but the value that it will add to your game is by far bigger than its size. It is a simple and straightforward device that has all the essential features that you would ever wish for in golf GPS. It might not have the fancy features in other modern devices, but you will not find anything better at that price, and so this makes it a good buy.